Valentineâ€™s Day Salad. Italian Classic Caprese Salad With Heart Formed Mozzarella, Basil, Balsamico And Tomatoes Served On Plate. Above View. Copy Space. Lizenzfreie Fotos, Bilder Und Stock Fotografie. Image 114371092. Standard-Bild - Valentineâ€™s Day salad. Italian classic caprese salad with heart formed mozzarella, basil, balsamico and tomatoes served on plate. Above view. Copy space. Valentineâ€™s Day salad. 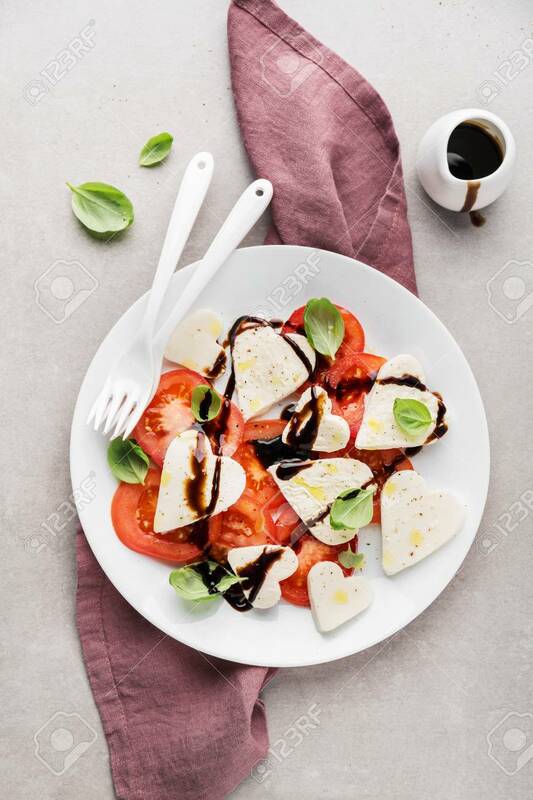 Italian classic caprese salad with heart formed mozzarella, basil, balsamico and tomatoes served on plate. Above view. Copy space.